Former welterweight world champions Andre Berto and Devon Alexander went face-to-face Thursday at the final press conference before their primetime main event Saturday, August 4 in the main event of Premier Boxing Champions on FOX & FOX Deportes from NYCB LIVE, home of the Nassau Veterans Memorial Coliseum. Also competing on Saturday’s telecast that starts at 7:30 p.m. ET/4:30 p.m. PT and squaring-off Thursday were former champion Peter Quillin and super middleweight contender J’Leon Love. Additional action on FOX and FOX Deportes will feature rising unbeaten prospect Joey Spencer in a super welterweight attraction. Headlining the FS2 and FOX Deportes telecast beginning at 5:30 p.m. ET/2:30 p.m. ET is unbeaten contender Marcus Browne of Staten Island, who takes on Lenin Castillo, and former champion Luis Collazo, who battles Bryant Perrella in welterweight action, who were both in attendance at Thursday’s press conference. Competing in undercard action and participating in Thursday’s press conference in her hometown was WBA Super Middleweight Women’s World Champion Alicia Napoleon, who defends her title against Scotland’s Hannah Rankin. “A lot of these people on this card have been guys I’ve been around since they were coming up. I’ve been in the game for a while and I’ve been cracking heads for a while. “We had a tremendous training camp for this fight. I took time to rejuvenate myself and I’ve come back and gotten myself into great shape. I appreciate what Devon Alexander has been through, but he’s dealing with a different animal on Saturday night. “I’ve pushed hard to give myself the best chance to win on Saturday. We’ve prepared for everything that we think Devon can bring. I’m physically and mentally prepared for a battle. “I’m going to push Devon. I don’t think he’s fought any that brings what I do since he came back from his layoff. We’re going to see if he’s back. If he’s not ready, then I’m going to make it a long night for him. “I’m thankful that I can continue to fight, build my legacy and do something I love. I’m grateful to be here and show off my talent. I’m still writing my legacy and Berto is just another stepping stone in my way. I have to get past him. “We had a great training camp down in Florida. Coach Cunningham has prepared me as well as for any fight in my career. The focus and dedication we put into camp will all show in the ring on fight night. “Andre Berto was a great champion and I definitely respect what he’s done in this sport. Both of us need this win badly though and I’m sure neither of us will look to take a step back on our way to a victory. “I love being in New York. I always get a lot of love from the fans, and they’re definitely a passionate group of fans. I’m going to be ready for the bright lights on Saturday. “I am more than ready for this fight. I have a lot of history with J’Leon Love. I’m going to be ready for him and it’s going to be a fight the fans won’t want to miss. “I’m very blessed to be back in this position. Coach Sosa has really been a great gift for me. He’s helped me mentally and physically build on everything I had done with Virgil Hunter in the two years prior. “Being back in New York definitely helps make me feel like I’ve made it back. I can be back in front of my fans, and most importantly my family, so that I can feel their support and let it carry me in the ring. “We’ve worked on everything in camp and we’re ready to put on a show Saturday. I’m ready to show everyone that I still have what it takes to compete for a world title. This is something I’ve been looking forward to for a long time now. “I appreciate people coming out. I love coming to New York. This is a great card with so many great fighters and I’m grateful for the opportunity. “I’ve been waiting for this for a long time. Come August 4, you will see me display my talent. I have nothing but respect for Peter Quillin, but this is why they call it the crossroads. We have to run into each other. “I’m not worried about anything Peter has done in past fights. I’m prepared for the best Peter Quillin we’ve seen. He’s not going to catch me by surprise in there. “I just have to be smart, listen to my corner and impose my game plan. I know that I have the skills to win and win convincingly. If I follow the game plan, I’m going to show everyone I’m ready for the best in the division. “It’s been a while but I’m thankful to be back. I’m super ready to go in there on Saturday night and put on a show for you guys. I’m going to do what I do best, and keep my name in title contention. “I know that my opponent is skilled and he’s going to be ready to try to upset me. But I’ve worked too hard in camp to let anyone walk into my home and beat me. It’s just not happening. “I’ve made sure to just stay patient and know that my time is coming. I’m going to keep adding to my resume until there’s no one who can deny my shot. “It’s great to be here. I want to give thanks for everyone who has helped me in the last 18 months while I recovered from my injury. It was hard, but it was a process I had to go to. “My team has supported me through thick and thin no matter what I’ve been through. That included my dad, who originally brought me into the gym when I was a kid. This is just what I love to do. “My opponent is young and desperate to put a name on his record. He’s got some skills that we’ve prepared for. I’m confident he doesn’t have anything I haven’t seen before. “This is a big card with a lot of action and I’m proud to be on it. Hannah is a wonderful champion and this is going to be a great fight. This is a tremendous opportunity and we’re going to continue to push for better and better opportunities for female fighters. “This is a fight you won’t want to miss. I’ve had a great camp and I’m prepared for another war. I won this title at Barclays Center in March and I can’t wait to see everyone out cheering for us on Saturday. “It’s fantastic to be on such a great card. I’ve been looking for a big fight like this and it couldn’t have come at a better time for me. “When I got the call for this fight I was obviously going to say yes. Camp has been amazing and I can’t wait to go in there on Saturday night and show everyone what I’m capable of. “This should be a sensational show on Saturday, live on FOX and FOX Deportes beginning at 7:30 p.m. ET. There is also a terrific show that actually begins on FS2 and FOX Deportes at 5:30 p.m. ET. This is a loaded card from top to bottom, as you can see from the dais here. It features a number of the best fighters in the world. 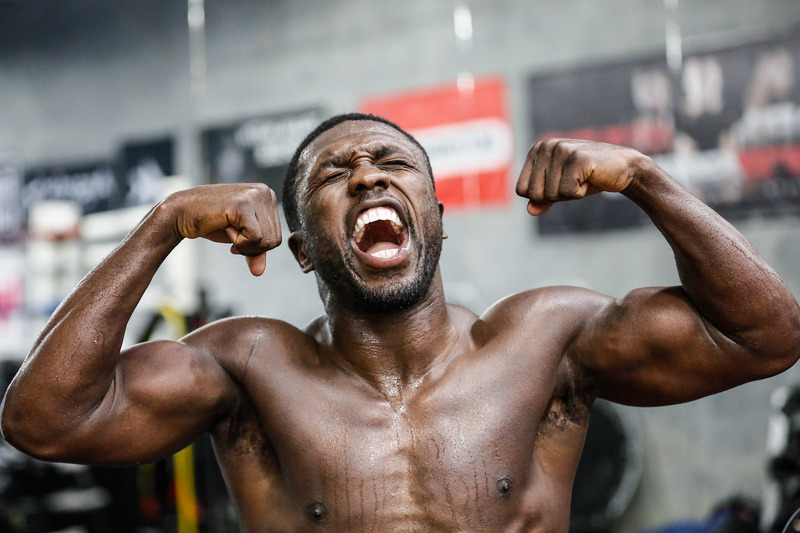 “The main event features two men in Andre Berto and Devon Alexander who are both multiple time world champions, well known fighters and fighters who need this win. The recipe for a great fight is two terrific boxers who must win. “The co-featured event is a similar bout. Peter Quillin and J’Leon Love are guys who are in the championship picture at 168-pounds. The reality is the winner of this fight will have a chance to fight for the title soon.